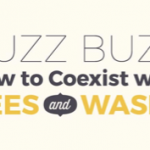 Have you heard the latest buzz? Los Angeles has laid out the backyard welcome mat for honeybees. Urban beekeepers couldn’t be happier. After several years of discussion, lawmakers recently joined an increasing number of cities, including Santa Monica, Redondo Beach and Culver City, in attempts to help protect them. Honeybee fans are thrilled, but some people still worry about safety concerns, particularly for those with bee allergies. The new ordinance requires urban beekeepers to register their hives with Los Angeles County, regulates their distance from property boundaries and nearby streets and calls for them to be kept high above ground and surrounded by a structure, such as a wall or hedge. Typically, only two hives would be allowed at a residence. “We are very happy that more people and cities are recognizing the importance of honeybees, but everyone should know they’re already here. On average in Los Angeles, there are nine to 11 colonies per square mile. The honeybees live in attics, trees and everywhere, so it’s not that we’re bringing in more. We’re simply trying to protect the ones here,” said Chelsea McFarland, an urban beekeeper along with her husband and the chief executive officer of HoneyLove, a nonprofit in Santa Monica. 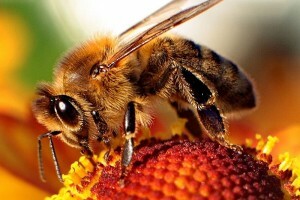 Honey bees are responsible for $15 billion in U.S. agriculture crops each year, and pollinate 80% of the world’s plants. 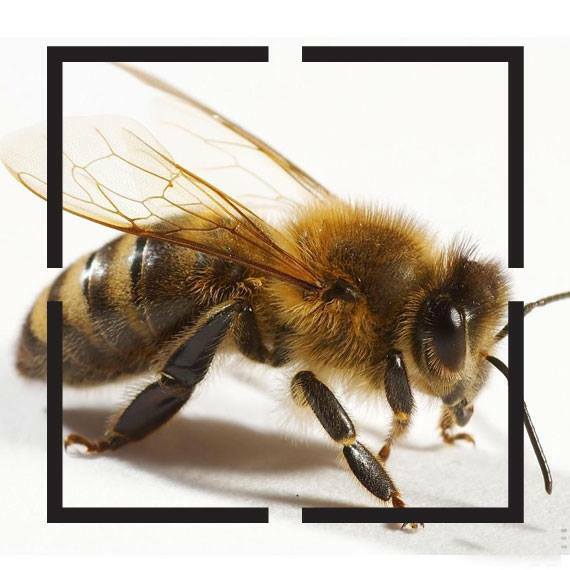 What’s alarming is beekeepers are losing up to 50% of their hives every year, often vanishing without a trace or explanation. For Ford owners Rob and Chelsea McFarland, keeping these bees buzzing has become a passion, and they’re turning the city of Los Angeles into an unlikely urban beekeeping haven through community outreach, education and, of course, a few beehives of their own. 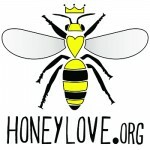 To learn more about urban beekeeping and how you can help keep these important bees buzzing visit, honeylove.org. 10,000 Bees Beard with Rhett & Link! We put 10,000 bees all over Link’s face! Urban beekeeping, along with other more typically rural pursuits like raising chickens and planting edible gardens, has become more popular as a part of the homesteading movement. Not only do urban beekeepers actually have several advantages over their rural counterparts—rural areas are doused with pesticides, they don’t offer the same variety of plants as cities and the bees don’t have to be trucked in to Los Angeles—but the bees are already here. They also have a more diverse, year-round source for pollen. Unfortunately, up until this point, beekeeping in city limits has been against the law. Many have been campaigning to change that. 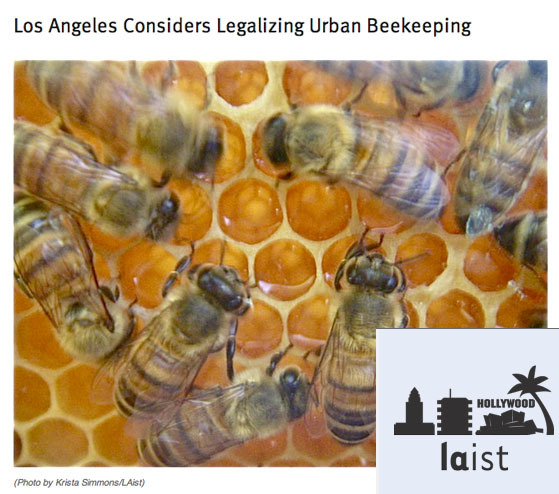 And today the Los Angeles City Council voted unanimously to conduct a study on legalizing urban beekeeping in Los Angeles, according to City News Service. The study would look into overturning the law banning beekeeping in areas where there are single-family homes. The council also passed a motion that calls on the city to explore more humane ways of removing bees other than extermination. A third motion passed supports federal protections for bees against pesticides. Councilman Paul Koretz said the state has been losing a third of its bees a year since 2006, threatening California’s avocado and almond growing industry. Beekeeping proponents showed up to the City Council meeting to show their support. The LA Times’ Emily Alpert Reyes said there was at least one beekeeping outfit and a fair number of bee costumes, including a doggie bee costume in attendance this morning. “Bees are in real trouble, and urban beekeeping is part of the solution,” Rob McFarland of HoneyLove, an organizing supporting bee farming in Los Angeles, told the City Council. 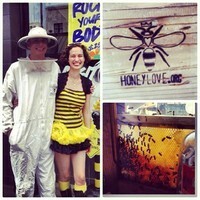 Hopefully the buzz will turn into a sweet resolution for city dwellers and aspiring hive owners alike. 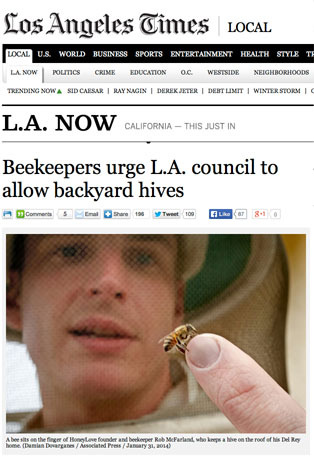 by Emily Alpert Reyes—February 12, 2014, 8:22 a.m.
Backyard beekeepers are urging the city to allow Angelenos to keep hives at home, joining the ranks of cities such as New York and Santa Monica that already permit the practice in residential areas. The Los Angeles City Council is slated to vote Wednesday on whether to ask city officials to draw up a report on allowing beekeeping in residential zones, a possible first step toward permitting backyard beekeeping. Under Los Angeles city codes, beekeeping isn’t allowed in residential zones, according to city planning officials. Backyard beekeeping has nonetheless blossomed as Angelenos committed to locavore living or worried about the health of honeybees have started tending hives at home. “It’s the yummiest way of breaking the law,” said Max Wong, who keeps bees in her backyard in Mount Washington. Her neighbors were stunned when she told them it wasn’t allowed there under city code, she said. “Beekeeping should never have been illegal,” Wong said. The image of urban greenery is “part of what makes Los Angeles, Los Angeles,” she said. So far, both beekeepers and city officials say few complaints have been lodged about illegal beekeeping in Los Angeles neighborhoods. Such complaints are so rare, said Department of Building and Safety spokesman Luke Zamperini, that the department doesn’t track them in their own category. Beekeepers argue that new rules would nonetheless wipe out the legal unease they now face in the city, clearing up exactly what is allowed.